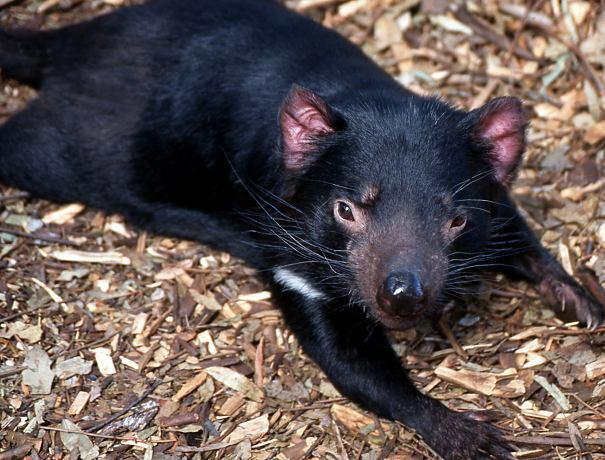 The fascinating Tasmanian devil is a carnivorous, semi-nocturnal creature, whose aggressive nature and wild hissing, growling and screaming earned it the name. 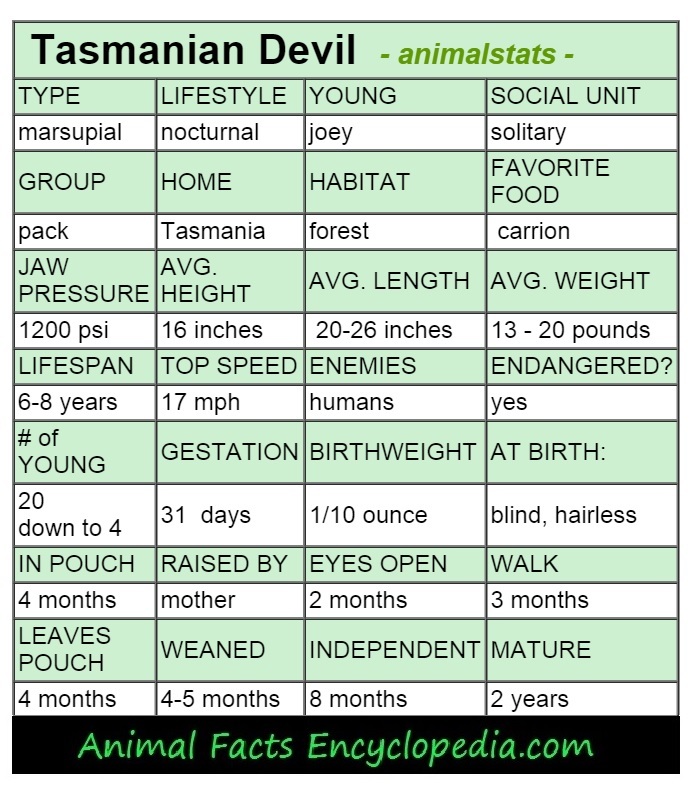 A full-grown Tasmanian devil is only about the size of a big housecat, but it is the largest meat-eating marsupial, and its voracious appetite is a thing of legend. 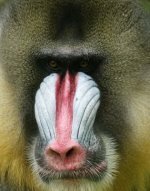 While devils are usually solitary, their excellent noses will often lead several of them to the same carcass at once, and communal feeding is rather common. 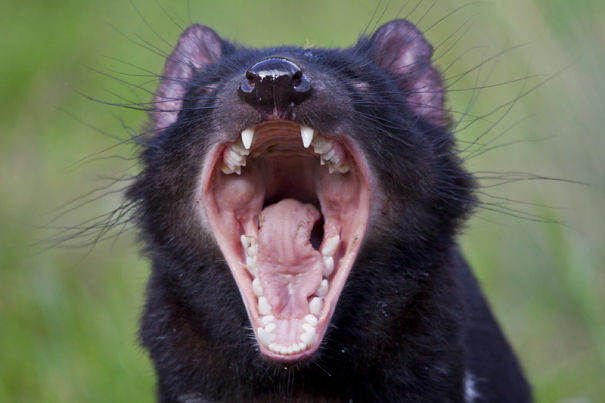 Tasmanian devils have powerful jaws filled with large sharp teeth, and a feeding group will devour every last bit of a meal, be it rabbit or kangaroo, bones and all. 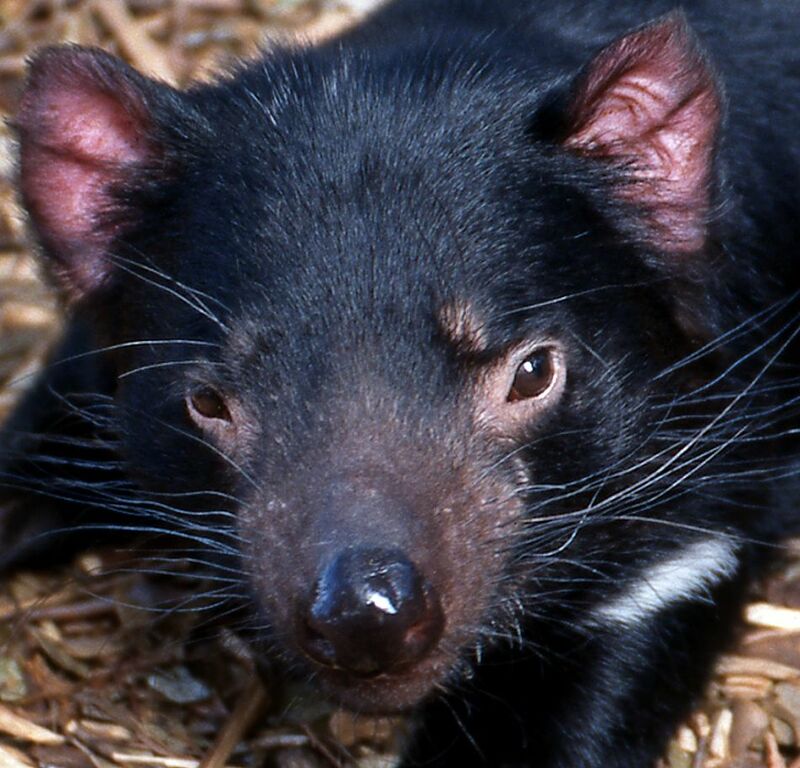 Devils are mostly scavengers, and are considered very valuable to the environment as sort of 4-legged vacuum cleaners. They hunt as well, taking birds, insects and other small game. 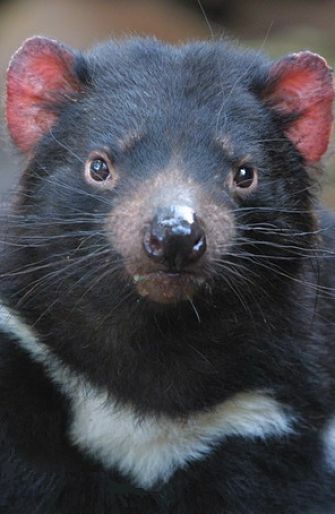 Living in woodlands and eucalyptus forests on the Australian island state of Tasmania, devils can be seen out and about during daylight hours, but do most of their stalking and scavenging at night. 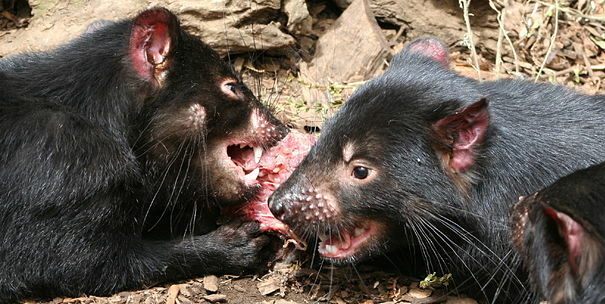 Tasmanian devils fight allot, and are known for their fierceness, but they will often use a few clever techniques first, before resorting to full out combat. When a dispute finds two devils face to face, their skin will flush red, turning the ears crimson, and they will gape their impressive jaws at each other, screaming and growling the whole time. If the situation is stressful enough, the devil will release a musky odor that would clear most rooms. 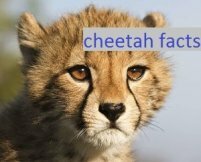 Finally, they will emit a stacatto sneeze that is sometimes so violent they loose their footing. If all else fails, its time to rumble, and most devils have the scars to prove it. 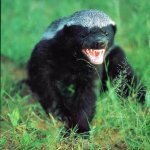 It's not hard to snap a photo of a Tasmanian devil with its mouth agape - the familiar pose is used in many instances throughout the day, and expresses everything from joy to rage to the Tas version of nervous laughter. 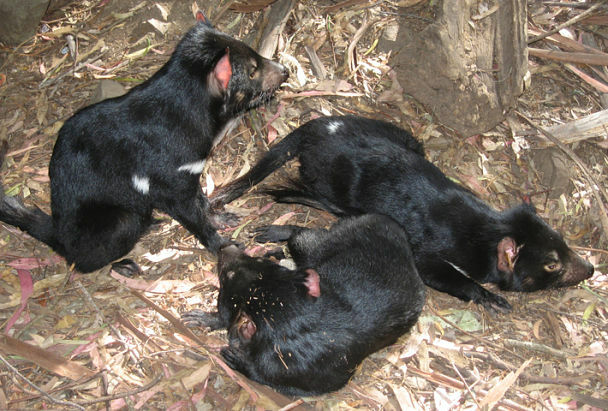 Tasmanian devils are marsupials, like kangaroos and koala bears, which means that their babies start to develop in the womb, but then move to a pouch on the mothers abdomen to continue growing. 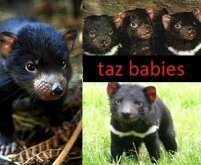 Female Tasmanian devils come into heat in springtime, and the month long mating season is filled with lots of extreme activity. Males battle each other viciously for the attention of mature females, but it does not end there. Once the most powerful male sends weaker competition fleeing, he must prove his worth to his sweetheart. 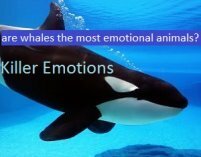 The mating pair will engage in loud, highly aggressive wrestling sessions, and if the female is not impressed, she will move on to another fellow. 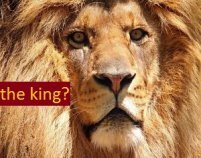 If the male is powerful and dominant enough, the two will mate several times over the course of a few days. 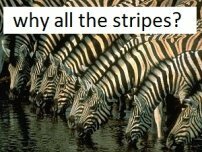 Both males and females may mate with numerous partners during the season, and it is actually possible for one litter of babies to have two, three, or even four different fathers. After about three weeks of pregnancy the female Tasmanian devil finds a comfortable den and settles in. She will give birth to as many as 30 tiny babies that are blind, hairless, and less than the size of a single grain of rice. 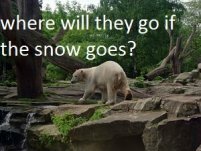 They are effectively still just embryos, and must make it to the mothers pouch in order to continue development. 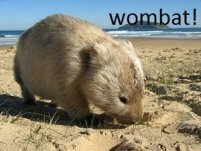 Without their mothers help, an army of squirming babies crawl through a forest of belly-hair from the birth canal to the mothers pouch, which is a distance of about 4 inches, (a long trip for a grain of rice). 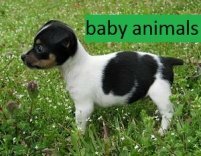 Then, in a true example of "survival of the fittest" the baby Tasmanian devils find only four teats in the mothers pouch. The four that make it to a teat first survive, the rest perish. Four months later, the tough little devils emerge from moms pouch and explore their world. 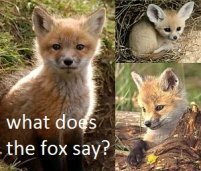 The sound of a litter of devils play fighting is blood-curdling and constant, and by the time they are eight months old, they start off on their own, complaining the whole way. Like a miniature African lion the always ravenous Tasmanian devil is a "gorge feeder" filling up to the brim as long as food is available and then collapsing flat on the ready-to-bust belly, legs outstretched, to digest the huge meal. Step One: Scurry about wailing and complaining till you find something dead. Step Two: Eat till you're ready to explode. 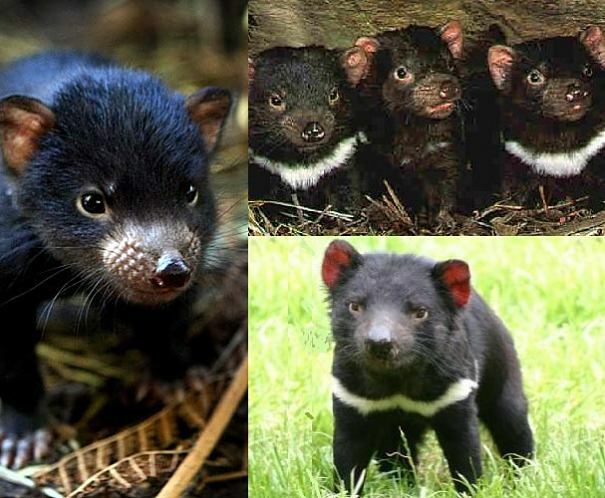 In the late 1990's an unusual cancer began to appear in the wild populations of Tasmanian devils. Know as "devil facial tumor disease" or "DFTD" it has caused a disturbing drop in devil population. 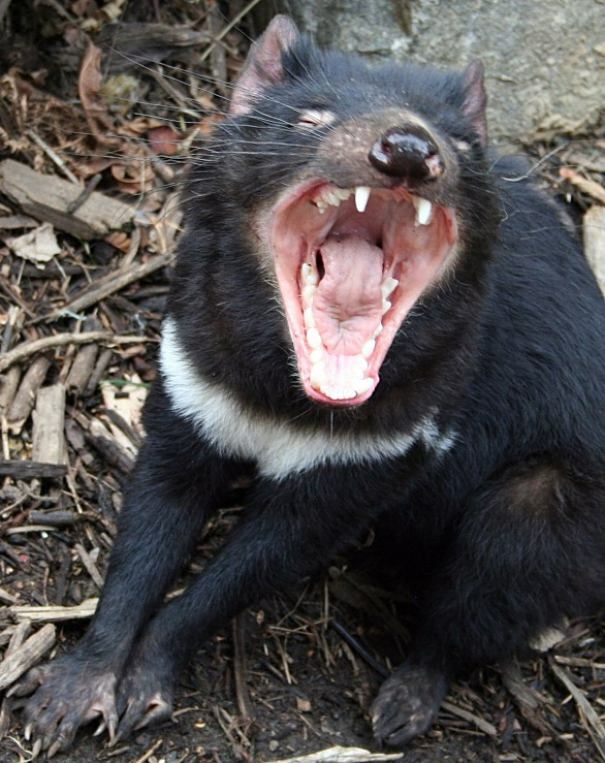 The Tasmanian devils jaws open a full 80 degrees and it has a bite strength of 1200 PSI! 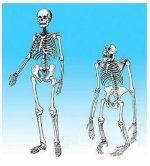 The devil stores fat in its tail so when food is scarce the tail is narrow and limp, when life is good the tail is fat and happy. 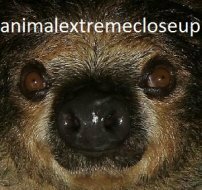 The huge head, massive neck and powerful jaws allow them to eat parts of carcasses that others might leave behind - like the bones!